Studio: GK Films, Smoke House, Warner Bros. Humor, drama, history and suspense are perfectly interwoven to reveal one amazing tale. There are some liberties taken to enhance the thrills, but the endeavor’s spirit remains firmly intact. The true story behind Argo, the new Ben Affleck film about six hostages who somehow manage to escape Iran in the midst of the U.S. hostage crisis, is almost unbelievable. A larger-than-life CIA-driven extrication plan that involved the collaboration of two countries and two Hollywood moviemakers, the real-life drama naturally lends itself to the big screen. And, while the film includes a little rewriting to play up the suspense of the situation, this well-acted and superbly directed nail-biter keeps it real enough to convey the danger and drama behind the incredible tale. 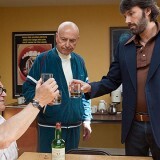 The film’s protagonist, CIA operative Tony Mendez (actor/director Ben Affleck), gets called into a special meeting about six Americans who escaped the overtaken American Embassy and made it to the Canadian ambassador’s house. The U.S. team of government reps brainstorms methods of rescue that range from riding bicycles some 300 miles to the border to having them pose as crop inspectors. Tony’s far-fetched plan? Create a fake Hollywood sci-fi film and pretend the Americans in hiding are a Canadian film crew in Iran to scout locations. Shockingly, this proposal is the “best worst” idea of the bunch. Tony immediately flies to L.A. to meet with filmmakers Lester Siegel (Alan Arkin) and John Chambers (John Goodman), who then buy a script, create storyboards, set up an office and host a press event. As Lester says, if they’re going to put together a fake movie, he wants it to be a fake hit. Calling themselves Studio Six Productions (named for the six Americans), they create fictitious names for the Americans and assign each a title. Tony flies into Iran on a fake passport, meets with the Americans and convinces them that posing as the film crew is their only viable option for escape. The film’s ending takes some liberties with the original story, but the spirit of the endeavor’s remains firmly intact. The escape attempt was a true act of heroism, and Affleck accurately captures that as he strikes a terrific balance between showing us the tension of the actual escape and the secretive behind-the-scenes maneuvers.